I loved the movie Evita with Madonna and Antonio Banderas, the music is just so beautiful. I also loved the Evita Musical on Broadway. When I had a trip planned to Buenos Aires, I decided to read up a little more about Evita. I was inspired by her story. Evita is the affectionate name for Eva Peron, who went from a rural town to make it big as an actress. Then, she married Juan Peron and then became the First Lady of Argentina. In this post, I wanted to share my experience visiting places connected to Evita. When you are planning your trip, you should also check out this comprehensive Buenos Aires guide or list of South America itinerary ideas. Also, consider visiting Colonia, it’s an easy day trip from Buenos Aires. Casa Rosada, lives up to its name which translates to Pink House. 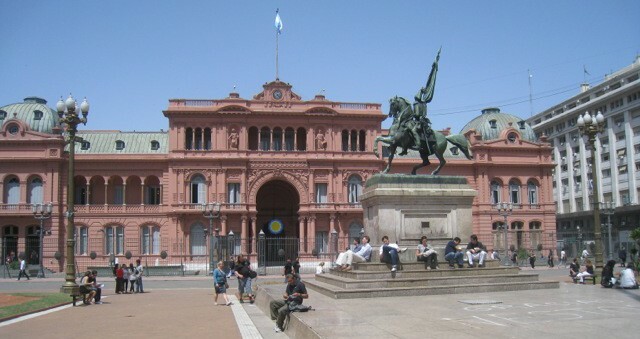 Casa Rosada, which translates to Pink House, is the place Evita gave her famous speech. In the movie, she sang “Don’t Cry for Me Argentina” from what is now known as the Eva Peron balcony. It is the executive mansion and office of the President. It is located in Plaza de Mayo and is a beautiful building. There is also a museum in the building that houses objects related to former Presidents. Unfortunately, when we were there, the museum was closed (check the operating hours before you plan to visit). Speaking of museums, there is actually an Evita Museum in Buenos Aires. 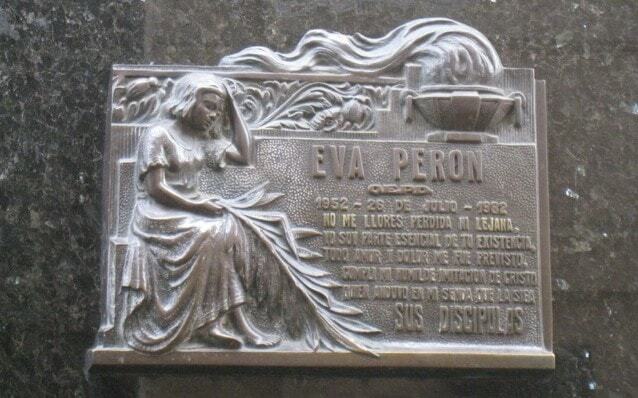 Yes, a whole museum dedicated to Eva Peron. The Museo Evita is housed in a building that used to be a shelter for women and children that Evita had established through her foundation. The Evita Museum gives you more information about her starting with her difficult family life all the way to her death. There were videos, pictures, and even some of her belongings that brought her story to life. 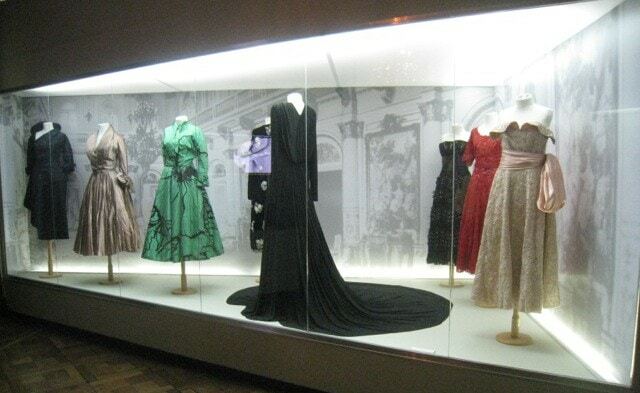 Some of the dresses that Eva Peron wore were on exhibit in the museum. If you get a chance you should also check out the Museo Evita Restaurant. They have a nice outdoor garden area and the food is supposed to be delicious. Unfortunately, I didn’t know about the Evita restaurant and ate just before going to the Eva Peron museum. Museo Evita is open Tuesday-Sunday from 11 am to 7 pm. Please note that they are closed Mondays, Christmas Day, New Years Day, and May 1. 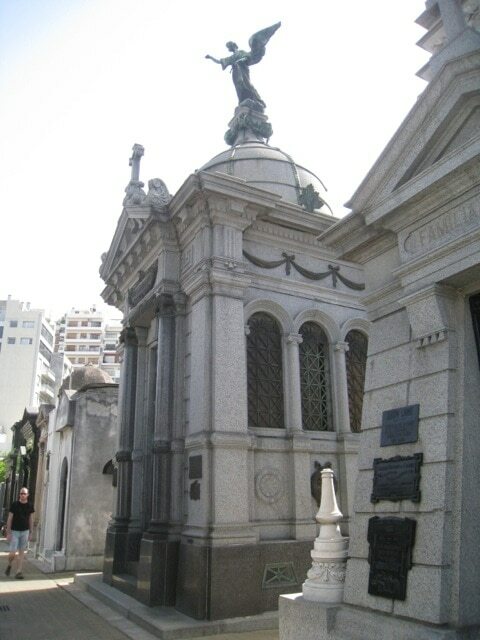 Evita is buried at the Cementerio de la Recoleta. Even if she wasn’t buried there, the cemetery is worth a visit to see the elaborate mausoleums. I incorrectly assumed that Evita’s grave would be the main attraction here. 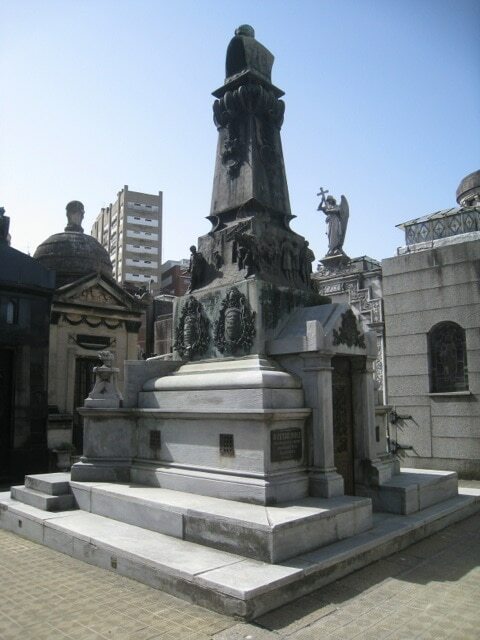 I didn’t realize that many other notable people like former presidents of Argentina, Noble Prize winners, and writers were also buried here (a list of other significant people buried can be found here). We walked around a little bit to see if we could find Evita. This cemetery is huge and it is easy to get lost in the maze. After a little bit of wandering and admiring the mausoleums, we had to return back to the entrance to look at the map and find Eva Peron’s grave site. One example of an elaborate mausoleum. More elaborate mausoleums. Row after row of these. Evita’s final resting place is towards the back in the middle of a row, very inconspicuous compared to other mausoleums. Originally, there was going to a huge memorial in her honor, but before the memorial was built, there was a military coup. A military dictatorship took over and the location of her body was a mystery for 16 years. Then it was revealed that she was buried in Milan. In 1971, her body was exhumed and flown to Spain, where Juan Peron was living in exile. After his death, his third wife, Isabel Peron, became President of Argentina and she bought Evita’s body back to Argentina. So she is now buried with her family, under several trap doors for added security. The nameplate on Evita’s grave. You could see all three of these Evita sites in the same day, unfortunately, none are very close to each other. (see map). It may be best to break it up and see each site when you are exploring each neighborhood. I love the story of Evita and experiencing these places brought it to life. It is almost like a fairy tale but with a tragic ending. I think about how much she accomplished in only 33 years, with so many obstacles, and it motivates me to do more. Have you seen Evita? I would love to hear what you thought. Watch the movie Evita. It provides a good background on her story and the music is beautiful (you can find the soundtrack here). Double check opening hours for the museum at Casa Rosada, if you plan on going to it. Use the map at the front of the cemetery to locate Evita’s grave since it is not easy to find. Learn more about Evita’s story at the Evita Museum. What an interesting story! I’ve never seen the movie but I feel like now I have to watch it after reading your post and the amazing story! Madi – thanks for your comment, the movie is great, I especially like the music. Since it is a musical it really is doesn’t tell the whole story. If you are interested, I would also recommend reading the wikipedia pages that I linked in my blog. Great pictures! I love Buenos Aires and I’ll have to check out the Evita Museum next time I am there. Thank you. Yes check it out and let me know what you think.